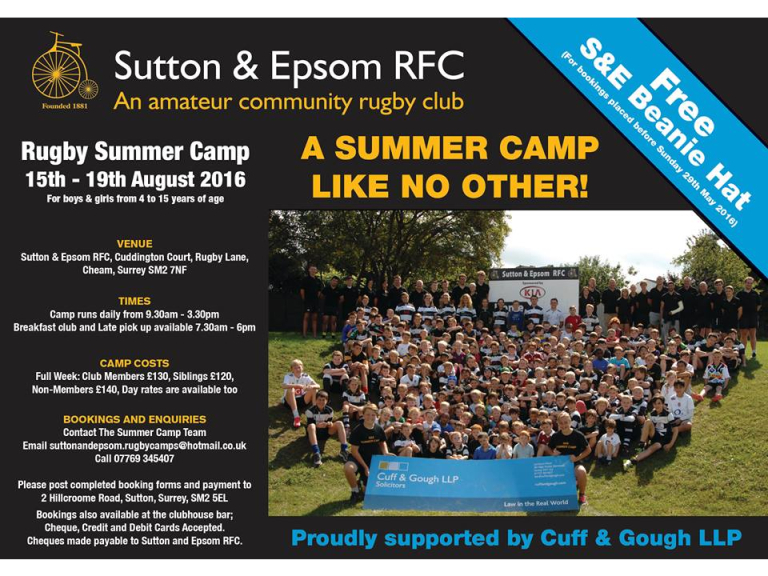 Local Solicitors, Cuff and Gough LLP, are proud to support Sutton and Epsom Rugby Club’s Summer Camp for another year! The Summer camp is extremely popular and this year promises to be bigger and better than ever! It’s a Summer Camp like no other with water-fights, tournaments, BBQ’s and more! But of course, it’s 5 days of packed full of rugby where your child learns to play the SUTTS Way! The Camp takes place between Monday 15th – Friday 19th August 2016. Over 200 children were at the camp last year so make sure you don’t miss out! ** Early-Bird Bookings!! ** Bookings received before Sunday 29th May 2016 will receive a Free S&E Beanie Hat!